One of the rarer swirls and hard to find in great condition. 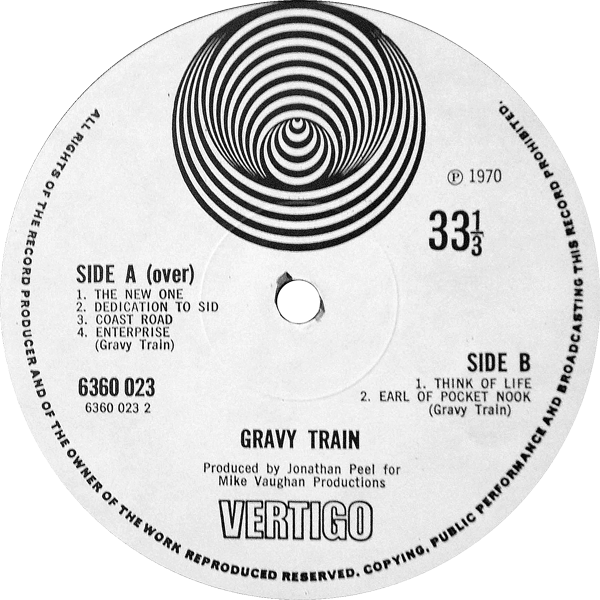 Gravy Train’s eponymous 1970 debut on Vertigo features a textured gatefold sleeve, designed and photographed by Hipgnosis. 1. Both gatefold sleeves are textured, but the genuine version is a more pronounced texture and is also textured on the inner gatefold. The repro copy is smoother (you can still see a faint texture to the outer cover but it is less obvious) and has no texture to the inner gatefold. 2. The printing of all wording on the original inner sleeve is black, the repro version is dark purple and not as sharp. 3. Both sleeves have the correct wording and catalogue number on the spine but the genuine version is white and the repro is printed in black. 4. Genuine vinyl weighs in at 146g, the repro weighs 129g. Also, there is less deadwax area on the genuine copy. The repro has much more deadwax area as though the recording grooves are packed tighter together. And of course, the repro has fairly large hand etched matrices. One thing that is very interesting on the bona fide copy however, is that the matrix on the B side of the stamped matrix has a hand etched ’3′ to complete the catalogue number. It looks as though the stamp was erroneously incomplete. So, did the ‘stampers’ break/get mislaid? Are there versions with fully complete stamped matrices? Watch this space!